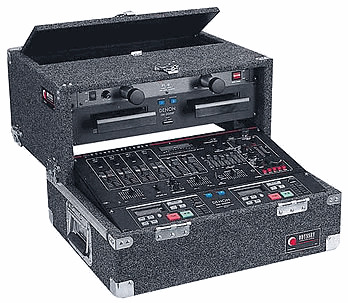 Odyssey CS4800 Slide Style Rack Carpeted DJParts - All Variety of Parts that DJ Needs. The patented slide-style cases are thoughtfully designed and solidly built. The slanted mixer area (8 spaces) is perfect for tape decks, EQ's, etc. The bottom section has 4 vertical spaces. Carpeted finish and heavy-duty recessed hardware. Detachable front cover included (not shown).